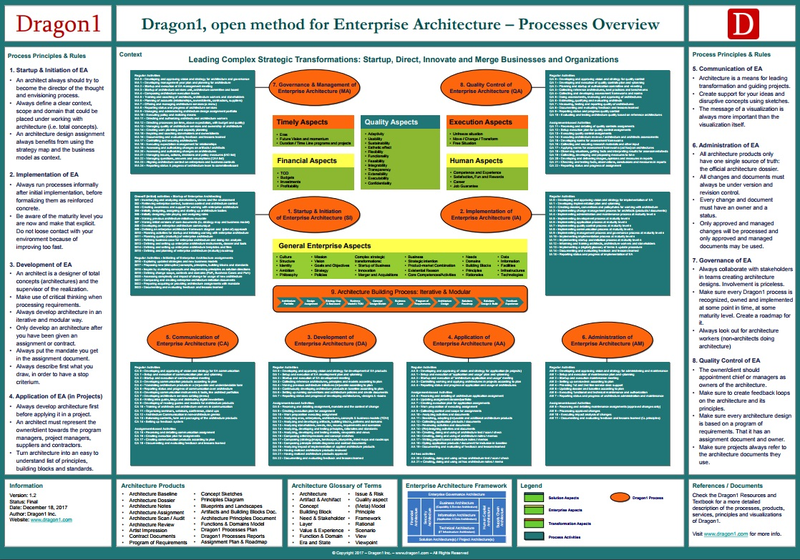 The Dragon1 Open EA Method recognizes 8 work processes. On this page, we provide you with an overview of these processes. The Dragon1 method has three levels of working with architecture: project-oriented, process oriented and product oriented. The architecture processes all address these three levels of working with architecture. What are Architecture Work Processes ? Architecture Work Processes are groups of activities centered around a common theme, such as the governance and management of architecture. The benefit of identifying and recognizing processes is that you will start to align the activities with each other more so they act more efficiently and effectively together. This all will result in processes with a higher quality result and outcome. Why do Architects work with Architecture Work Processes ? In Dragon1 all the activities that make up the work of an architect are grouped into work processes. This makes it easier for people to work together or to take over someone else's work. In every work process each activity has a defined input and output. Many activities contribute to the creation of a deliverable. 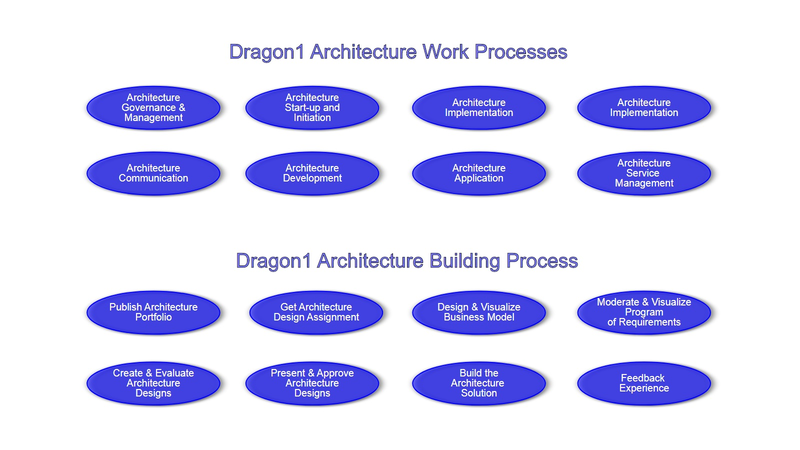 The following diagram is the reference model for Dragon1 architecture work processes. Architecture Government & Management - the process about using structures, organizations and bodies to have a controlled way of working with architecture. Architecture Start-up & Initiation - the process on how to fire start working with architecture in an organization. Architecture Implementation - the process on how to setup structures, organizations and bodies and how to implement processes and continuously improve working with architecture: from maturity level 1 to maturity level 5. Architecture Quality Control - the process on how to measure and improve quality of architecture products. Architecture Communication - the process on how to present architecture. Architecture Development - the process on how to collect requirement and design architecture. Architecture Application - the process on how have architecture used in projects and transformation. Architecture Service Management - the central process from which services are provided to internal and external stakeholders. The relationship between the work processes and the building process is that the sub processes are also present in the work processes but are now shown from and end-to-end path view that is recognized by the stakeholders of the architect.